A unique contribution to the development of traditional Chinese medicine (TCM), this book consists of 391 herbal formulae prescribed for Empress Dowager Cixi and Emperor Guangxu. These formulae are classified according to their actions and indications, and include detailed comments. Emperors and empresses, the supreme dignity and power of feudal China, benefited from the best health care in their respective historical periods. Herbal prescriptions formulated for them therefore represented the highest level of TCM, particularly in the late Qing dynasty. Empress Dowager Cixi was one who exercised a dictatorship over state power for many years. In those days, the most established and experienced TCM practitioners throughout China were summoned to the Forbidden City in service of her health and longevity. 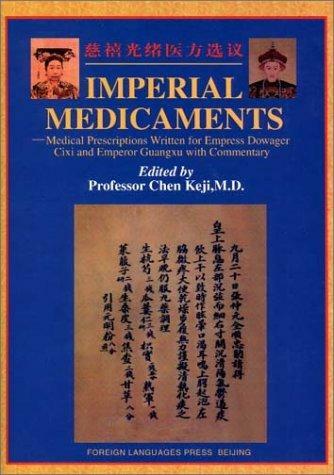 And prescriptions for those past emperors and empresses were called the Secret Remedies of the Imperial Palace. Approached from the philosophy of modern medicine and TCM, Professor Chen and his researchers painstakingly examined these ancient medical files. The result is a book of high academic value and practicability that also serves as a handy reference for the study of TCM by making ancient medicine useful in modern practice.